The Volkswagen Golf GTI arrived on our shores for the 1985 model year sporting an even 100 horsepower–and at the time, that was just plenty for full-on hooning. Like its predecessor, the Rabbit GTI, this new GTI used a proven formula. Step 1: Take Volkswagen’s popular three-door hatchback. Step 2: Turn up the wick just enough. In this case, “just enough” again included a bit more power than the standard car, plus bigger brakes and a stiffer suspension. Occupants continued to be greeted with nicely bolstered seats and big, legible gauges. The final step: Just the right amount of red accents to alert those in the know. The Golf chassis was a bit stiffer than the Rabbit that it replaced. The new car was also longer, wider, taller and heavier, yet its rounded edges lowered the coefficient of drag. Both cars featured the same 1780cc of displacement, but the Golf GTI received a higher compression ratio plus a more aggressive camshaft and an updated Bosch fuel injection setup. Those little differences gave the newer GTI a bump in performance over its predecessor and kept the GTI nameplate competitive almost everywhere, from SCCA autocross and Improved Touring road racing to IMSA Firehawk endurance competition. The GTI wasn’t fast by today’s standards–figure the zero-to-60 sprint took close to 10 seconds–but back then it was plenty quick enough. 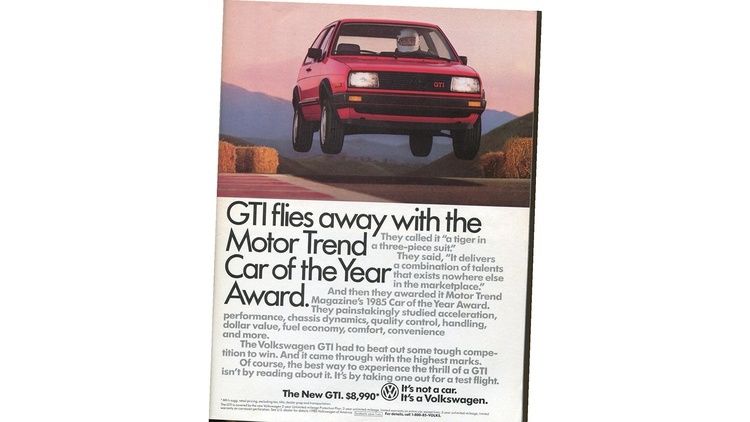 The GTI also delivered that distinctive German driving experience to those on a budget. Seating up front was rather upright, and thin A-pillars revealed a wide view of the road. The strut front suspension and torsion bar rear might sound primitive by today’s standards, but a 2150-pound curb weight made the GTI light on its feet. Things didn’t stay still for the GTI. A 123-horsepower, 16-valve sibling was added for the 1987 model year, while both eight- and 16-valve cars received bigger, body-colored bumpers for 1990. The last big upgrade came for 1991, as the 16-valve’s engine grew to 2.0 liters, boosting output up to a then-impressive 134 horsepower. Back then we’d spend hours arguing which is the best example: the lighter, original car or the higher-output later ones. Today, just be happy to find a clean, original driver–about a $4000 purchase, give or take a grand or three. While it’s not the fastest hot hatch ever released, a well-prepped Golf GTI still turns heads today, attracting attention from old-school autocrossers to today’s stance crowd. Longtime GRMer Robert Bowen knows Volkswagens, so we turned to him for advice. “The engines are tough, with the eight-valve having a slightly better reputation for longevity. Check for evidence of the usual issues, such as a leaking head gasket or recent timing belt replacement. High-mileage 16-valve engines can be noisy, but they should quiet down once they get warm. “The GTI engine is great out of the box, but it’s easily modified for better on-track performance. The stock 16-valve cams are quite tame, so upgrading them and tuning the factory ECU can unleash power. Exhausts, intakes and even turbo kits are readily available. “VR6 and supercharged Corrado engines swap in with little drama, although the former tends to make the car nose-heavy. Later crossflow engines swap in easily as well, but without the downsides of the VR6 installation. “Almost any car you find will have a bad second gear synchro. Parts for the rebuild are inexpensive and widely available, but it’s not a pleasant job. “Corrado G60 strut bearings are a nice, inexpensive upgrade for the front suspension, but Ground Control makes some nifty bolt-in camber plates that work even better for track use. “By now, the control arm bushings in almost every GTI are probably shot. Delrin, polyurethane and even all-steel spherical bearing replacements are available. You can also upgrade the rear control arm bushings to the later R32 units. “Upgrading to Passat 10.1-inch brakes or Corrado 11-inch brakes is easy enough, but these will require 14- and 15-inch wheels, respectively. For either swap, you’ll need the steering knuckles, hubs, calipers and caliper brackets along with the large rotors. “All but the later eight-valve GTIs came with four-wheel disc brakes. If your later car came with rear drums, it’s a simple swap–although the car will gain a little weight in the process. For all its quirks, I still loved my MK2 Golf/GTi. I will guess it has been several years since I have seen a 2nd generation....or even a 1st generation GTI. Even the Golfs and Rabbits of these generations are fast disappearing. So if I was going to buy a cheap GTI which I could absolutely rely on to do A->B every day, as well as be an entertaining weekend car, which one would it be? The Golf GT came out for 1988 and was the one with drum rear brakes and a more basic interior. All other drive train parts were GTI spec. The GT also had the Digifant injection which provided a much broader torque band. It was a real sleeper in ES autoX back in the day, as it was about 50lbs lighter. FYI: ALL of the 8v GTI's had rear Disk brakes. Golf GT also came as a 4dr and was easily upgraded to GTI spec. I am the proud and biased owner of a Mki Rabbit GTI setup for FSP autox. The 90-92 MkII GTI is what you want for the combined duty as it’s simply a lot better place to live. I have a 55,000 mile 1991 16V GTI in the garage. I need to get at it and make it roadworthy. It's been sitting for about 14 years now. Send it on over to me. My first "real" car was a '91 16V GTI. If any of you VW fans need a complete 2.0 liter ABA, I have one sitting in my garage I'd sell cheeep! It was a warranty return-- -valvetrain issue, so from what I understand it's nearly a zero-mile engine. It turns freely, but I've never attempted to run it. PM me if you want it. It would be an easy way to make a MK1, or MK2 car a lot of fun. My first "real" car was a 1985 GTI. It had issues but darn it if that car didn't get me infected with the VW sickness. I had a long line of Mk2 and Mk3 platform cars. Favourite was my last one. a 1992 "big bumper" Tornado Red Jetta sedan. I swapped in a 2.0 ABA bottom end, used the Digifant 8v head, tweaked the Digi flapper door, stainless header, Techtonics 272 cam, and complete Mk3 front subframe and rear beam swap with a boxed rear beam. also a Peloquin diff with a custom trans with close ratio 1-4 and overdrive 5th. I ran Nitto NT01's on it on the street. No, it wasn't a rocket, but damn that was a fun car to drive, and not a terrible commuter either. My second favourite was a 1990 "small bumper" Jetta GTX 2.0 16v. Pretty quick, but that CIS-E Motronic had some, uh, issues. I didn't have the patience for that one.